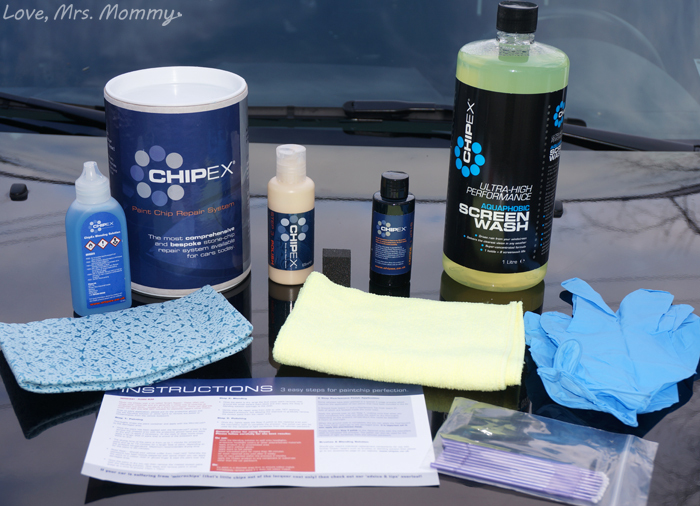 Love, Mrs. Mommy: Chipex’s Revolutionary Car Paint Touch-Up System Review & Giveaway! Chipex’s Revolutionary Car Paint Touch-Up System Review & Giveaway! I received a Chipex Road Rash Kit at no cost to facilitate this review. All opinions are my own. I have your chance to WIN a Chipex bundle worth $80.00 at the bottom of this review! Bundle includes the Road Rash Kit and Screen Wash! Open to US, Canada and Europe! We all have a few dings, scratches or other blemishes on our cars from normal wear and tear. It doesn’t seem to matter if you drive on the highway or an unpaved road, stones and other debris leave their mark on our 4-wheeled friends. Fortunately for us, Chipex is here and they are bringing new life to our cars, by making their blemishes almost impossible to see! Chipex is a revolutionary car paint touch-up system. They have a 100% color match guarantee and they promise to outperform all other touch-up paints! With this guarantee, I couldn’t wait to give them a try! After all, I definitely have a few spots on my car that I would love to see disappear! The Chipex website makes it super easy to find your car’s exact paint match. If you already have your color code, then you are all set. If you aren’t sure, you can type in your car manufacturer, make, and car color for a perfect match. If you aren’t sure which color yours is… as sometimes there are multiples of each color… you can check your manual, or the sticker on the inside of your car door (in my case), or you can even call the manufacturer. Once your information is loaded into the form, you can choose from 3 kits: Their Chipex Lite, Chipex Road Rash (which is what is shown here in this review), or the Chipex Medium. 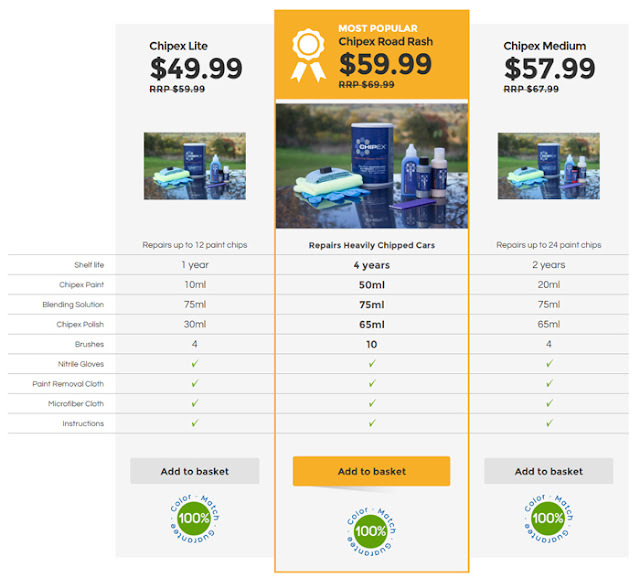 Shown on the page is a side-by-side comparison of each kit’s stats. This way you can get just what you need! Fixing my car was super easy and I was delighted to see how simple the steps where. I really liked how all the bottles were appropriately labeled (Step 1, Step 2, and Step 3). This feature really does give you a fool-proof feel, which is great for someone who hasn’t ever done touch-ups on a car before. My husband and I started out where there was a patch of 3 chips on the front of our hood. I thought that, well, if per chance this isn’t what it’s cracked up to be, these are tiny spots and it won’t look that bad if we did a terrible job. Well, I certainly didn’t need to worry about that! It came out beautifully, and I actually had a hard time finding where the chips used to be so that I could take a picture! We were so impressed with the first repair, that we thought we would try it on a different kind of blemish; scratches. There were a number of scratch lines that needed tending to on the side of our car. After cleaning the surface area, applying the paint, using the blending solution and polishing the area… we were successful again! I had to keep putting my finger next to the area where the scratches were, so that I could find them when I took a picture. In person, you just can’t even tell there was anything there to begin with! It’s unbelievable! This is definitely the best touch-up paint I have ever used! Even my husband was impressed, and he is quite the car aficionado! I am definitely going to take another look at the car to see what else we can touch-up! Plus, with the Road Rash Kit, the paint has a shelf life of 4 years! So, if down the road a new chip, scratch, etc. shows up, we are all set! Save your money with Chipex, because with their guarantee, how can you go wrong?! Here’s your chance to WIN a Chipex bundle worth $80.00!! Included is the Road Rash Kit and the Screen Wash! Connect: Find out more about Chipex by visiting their website. Then make sure you “like” them on Facebook and follow them on Twitter. Buy It: You can purchase a Road Rash Kit (and more) on their website! Disclosure: This giveaway is run by Chipex. They will draw the winner. Love, Mrs. Mommy is not held responsible for sponsors who do not fulfill their prize obligations. Love, Mrs. Mommy received a Chipex Road Rash Kit at no cost to facilitate the above-mentioned review. If you would like to participate in an event like this please contact LoveMrsMommy (at) gmail (dot) com. What a great kit!! Would love to win for my hubby! Thanks! This is a great kit. What a great product. I love the results that you showed. This is a cool kit. I would give this to my father for Christmas if I were to win it. Thank you for the chance. Would love to win this for my husband. He loves taking car of it (maybe a little to much lol). I think Chipex is a great idea! Both of our cars can really use this. My husband would be happy trying this. Thanks so much for the review, this is just what I needed. Some hot head carved a curse word into my bad door with he key and I need a way to fix it with going to the body shop. WOW!! I love what this can do to help your vehicle look nice again, I wish I had some of this for hubby before someone hit and run on our vehicle..